The note below, received yesterday from a Skype friend in China, shows why China is growing very quickly to be the economic superpower of the world. Look at the enthusiasm and motivation dripping from this young man’s message. He speaks great English (really) – better than the average Chinese. But his zeal for work is not unusual among Chinese young people now. They are raising a generation of workaholics, which will put their country into global preeminence but will give China the same societal problems that the US is dying of. However, Christianity is growing rapidly in China as well. The question is whether Christianity in China will defeat materialism, or whether materialism will defeat Christianity. 150 dollars per month is certainly not enough to live in the United States but in [my city], which is a city with a low standard of living, this amount of money can help me make a normal living, especially since I am living with my parents. Also I am very dear with money and don't spend a lot actually. Another thing, you don't have to sign a contract with me or provide any benefits, and you simply fire me anytime when you find me unqualified. I really hope you can give me a chance to prove with hard work that I can make contributions to your business and ultimate cause, which is to spread the word of God. You are even educating people about God on your corporate website J Most business websites don’t do that. There are a number of jobs here that allow me to use English, but only a little. And I am not so upset about this anymore because, after all, this is not an English speaking country so what can I expect? However, the internet is making the world so small that I believe I can use my computer to work for you in a way that is very similar to sitting in your office to work for you. I fully understand that it will take you a considerable amount of time and energy to train me, so I am willing to give up the first month’s pay. In other words, you don’t pay me a dime until the end of the second month, 150 dollars, no benefits and no bonuses, and I will be very happy because I know I am going to love this job! Well, I love English, I love computers, and I love working in front of a computer too! And this job combines all three elements! Money isn’t my object at all. Lately I’ve been researching online extensively about the possibility of me starting an Ebay business, which could be a way for me to work in an English environment. I talked about this idea with your Dad last night when I met him on Skype. However, today I found that Ebay has been taking measures to make it almost impossible now for new and especially small businessmen from China to enter the American Ebay market. This, many believe, is a result of massive scam operations conducted by Chinese Ebayers in recent years, causing a lot of damage to Ebay and its members. I feel so ashamed for those scammers! Now Ebay is refusing me, but I really hope you won’t refuse me too. Please give me a chance, and if I end up failing to meet your standards, just fire me without paying me a dime. I sincerely hope to work for you, Daniel. 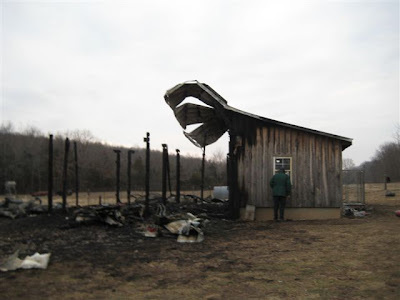 Some good friends of ours in Missouri just lost their barn to a fire two days ago. 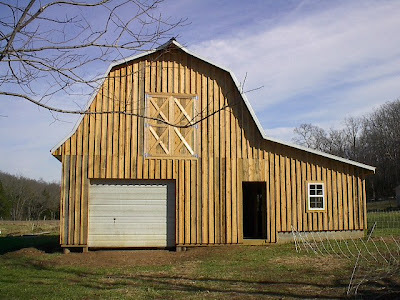 I ask that you would continue to lift up my family right now as they've lost the entire barn that my brother Joel built. Joel is still in Haiti right now, so it is hard for my family to know how to break the sad news to him. My dad believes the fire was started by a heat lamp that they had on the new baby goats. 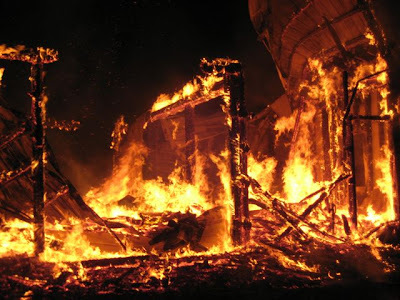 By the time Susie saw the fire out the window it was too big to save any of the goats, so they lost all their goats in the fire, as well as the entire woodshop upstairs, and my mom's summer kitchen and new grinder. The only things remaining were a few walls to the summer kitchen and the firemen were knocking down the walls to make sure the fire was all the way out. (6 firetrucks and a number of neighbors showed up). This is a very big loss, but they are grateful it wasn't the shop that caught on fire, and the house is fine, and the family is safe. Please pray especially for my little brother Ben, who was taking care of the animals in Joel's absence (he feels very bad about the fire) and for Joel. Susie said he had already lost 2-3 baby goats and 7 baby sheep while he's been gone, and now this tragedy on top. Here are pictures of the fire. Aren’t these gripping? This kind of thing is a good reminder that everything material here on earth is temporary and will ultimately burn. If, as the Bible teaches, the only things on this earth that will last forever are the souls of our fellow humans, it ought to affect and direct our priorities in life in very real and tangible ways. Lord Jesus, help us all to benefit from my friends’ tragedy as we remember afresh the fragility of possessions. In June 2006, US Presidential Candidate Barack Obama gave a speech which I feel reveals his essential beliefs. A man’s theology ultimate dictates his morality. If you want to learn more about the “core” Obama, read or watch this speech. It is a very interesting, open, and to some extent comprehensive speech. I think that Obama’s views match the views of the vast majority of the nation, and he does a good job articulating them. Because his views are so mainstream, I think he has a good chance of winning the Presidency. I also believe his beliefs are seriously in error. His speech evidences the relativistic pluralism which is seizing the heart of our nation, while the outer “shell” of religion remains (for now). Essentially the big error in his thinking is believing that good and evil can be determined without needing to rely on divine revelation. The truth is that if God has not told us what we should and should not do, anything can be justified. I think the basic difference between my family and most of the US church today is that we do not believe music is amoral. The prevailing belief seems to be that only the lyrics must be good, but the music that the words are set to does not matter. There are even some who say that it does not matter whether the music is so noisy that you cannot understand the words, as long as the musicians give a Christian message in between songs. We believe that music is a sort of language of its own. To illustrate, the hymns “Now the Day is Over” and “Onward Christian Soldiers” are the same meter, which means that the tunes can be interchanged. But “Now the Day is Over” is a very slow, peaceful bedtime song and “Onward Christian Soldiers” is a rousing marching song. It’s a good laugh to interchange the tunes. Anyone could recognize that the “message” of the tunes are different and cannot be interchanged without affecting the overall impact of the words. The messages of the tunes do not change with time or culture. People a hundred years from now will still be able to recognize the tune of “Onward Christian Soldiers” as a marching tune and of “Now the Day is Over” as a bedtime tune. We believe that the message of the music should match (as much as possible) the message of the words. A good example of this is two songs that talk about heaven and use many of the same words. ‘Cause heaven is a wonderful place. I said above that the message of the music should match the message of the words as much as possible. I throw in the “as much as possible” disclaimer because I think when it comes to singing about God, our earthly music can never do Him full justice. He is so awesome and glorious and multifaceted that even singing the Hallelujah Chorus for Him is a bit like singing Jingle Bells for the queen of England. But because we cannot give Him what He deserves does not mean that we should just give Him anything. We should still seek, as much as we know how, to worship Him with lyrics that match His character, and with tunes that match the lyrics. Do I believe that “bad” music is a sin? Hmm… I guess I would say that the short answer is yes, but that there are different degrees of sin involved depending on the motives and that even “good” music can be a sin. If someone honestly doesn’t know better and to him the highest expression of worship to God is to put Christian words to “Your Cheatin’ Heart” and sing it as a love song to God, he would actually be sinning less than someone who comes to church fresh from an unresolved fight with his wife and sings “Holy, Holy, Holy”. Thanks for your prayers, Mom is doing a lot better! Thank you so much for your prayers. Mom has been able to sleep pretty well the last two nights and has been able to start eating again about 24 hours ago. Dad and I have gotten rested again too. She still has a cough (and apparently 2 dislocated ribs from the cough) but it’s under control and it looks like she will pull through, thank You Jesus! The hardest part was not so much the extra physical labor but just the emotional drain of watching Mom in great suffering and not being able to do anything about it. This whole thing has given me a lot more respect for people who serve as caregivers, either voluntarily or professionally. Also I learned something about comforting those in distress. When we were in the middle of the really tough time, I didn’t have the emotional capacity left to deal with any well-meaning comforters who might want to call up and encourage me with a 10 minute prayer or Bible passage, or write me a long email with lots of advice. And all of you friends were great… your short notes of “We’re praying for you” were exactly what I needed to hear. I discovered that I don’t need to give a nice sermon on the benefits of suffering to those who are in the middle of distress. Sometimes fewer words are better. God used you to encourage me. Thank you, from the bottom of my heart. And you know, I guess God knows how to balance out our days. Yesterday a friend was, due to various pressures in his life, suicidal (very unusual if you knew how “macho” he is normally). Dad was able to encourage him with the truth a bit then and more this morning. I couldn’t help but think how we might not have been able to handle that call too well if it had occurred 24 hours earlier. Thanks God. You are good. All the time.